So in case you were wondering, I have officially changed skincare routine (Well technically I've changed it over the last 2 years or so, but it's almost completely different)! In case you were wondering, I have keep one product the same over the last 2 years, and that is my Aveeno Daily Moisturizing lotion.That is the ONLY thing I've kept the same. Everything else has changed, because it gets hard to go to certain places to pick up products. So I've basically resorted to using mostly drugstore products, because Target is so much closer to me, then the Lush store. 1. My cleansing Express: This stuff is amazing for taking off makeup. This is my go to makeup removing product! This is my second bottle. 2. Aveeno Daily Moisturizing Lotion: Oh, I think you already know. If you don't, then this stuff is amazing. It makes my skin feel soft, and just great. 3. Alba hawaiian Facial toner: This stuff is pretty good. If you haven't already check out my review. 4. Clean & Clear Morning Burst Cleanser in Skin Brightening: This stuff is okay. I've actually gone through two bottles of Clean & Clear cleansers in the last year. I bought the green one late last year, and finally finished it up. I also bought the blue one. This product is just meh. It's not amazing, it doesn't get rid of my acne, but it smells good. 5. The Body Shop's Tea Tree Face Mask: This stuff is amazing. I've had this container since last year, and a little goes a long way. I usually slather this stuff on my entire face, a thin layer will do! And then it starts to tingle. About 15 minutes later, you can rinse the mask off. 6. Biore Pore Unclogging Scrub: This stuff is amazing as well. Review of this one coming soon! 7. Paul & Joe Whitening Serum: This stuff is like serious spot treatment for me. I love this stuff! It's pretty good for on the spot. But this stuff is pretty expensive! I only have one bottle. Now I kind of want a new bottle for a backup, but omg it's $45 for a bottle? Wtf. I mean, the packaging is pretty and everything, but that's damn expensive. Currently I'm not using a eye cream, because I realized that there were little bumps around my eyes, on my lids, and below my eyes. It's called milla, and it can be removed by a dermatologist. But I'm lazy, so I decided to give up eye cream just for a little bit. I still have my bare minerals and my Dermalogica eye cream, but I have yet to use the second one. I just got the Dermalogica cream in last week, and I've been busy, that I haven't had a chance to actually use them wtf. What are your current skincare must have products? Me too! I love skincare products. 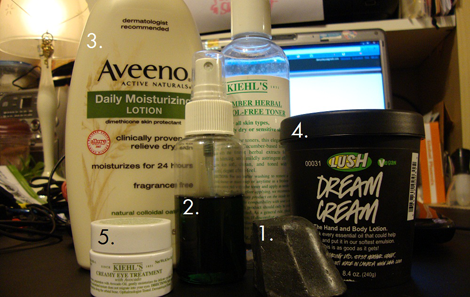 I've been trying out more drugstore products though, because I want to expand my collection! Found you through the Monday Blues blog hop link-up and you have a very cute blog! I love Alba products :) I'm following you now! Wondering where you got cleansing express from, since it looks Asian! Aveeno is a really good brand! My entire family uses it!